Never Stop Questioning – Never Stop Questioning! Sharing with my science students my passion for the natural world! In honor of the upcoming #WorldOceansDay ~ this Friday, June 8th.… I thought I’d share some newly acquired knowledge…. Stay curious! Coral reefs are hugely important ocean ecosystems that deserve our admiration and protection. The ridiculous diversity of marine life that can be observed by just patiently maintaining neutral buoyancy in the same spot for a :45 minute dive is jaw dropping. A few species I captured in Grand Cayman. My niece, Katie, graduated from the University of Puget Sound with a degree in Biology. She then spent several years working as a conservation biologist in the Samoan Islands. Is that work? Beyond the sea… Katie’s passion includes music. A classically trained musician (piano, cello, etc. at your age), she has creatively combined her two loves: the ocean and music into hauntingly beautiful electronic compositions under her stage name, Hydrah. Her musical art embraces bioacoustics as she weaves sounds from the coral reefs into her digital sound tracks. Bioacoustics is a scientific field that combines biology and sound. Our human ancestors “studied” bioacoustics for survival. It was used for hunting prey or avoiding predators. More modernly, understanding echolocation or identifying bird songs and the howling of wolf packs might come to mind as bioacoustics being used to help us improve our understanding of the natural world. Katie introduced me to an exciting, emerging field of research currently swirling around bioacoustics as it relates to protecting our endangered coral reefs. Who knew this existed? Not me! This might be an area that my sea-loving scientific students should consider for their futures… and our planet’s. Scientists are learning that they can “listen” to coral reefs to identify and quantify the diversity of marine life living there. Using highly sensitive recorders, bioacoustic marine scientists can study the sound vibrations made by the various living organisms on the reef. This is a non-invasive and possibly more efficient and accurate way of measuring the biodiversity of marine life on a coral reef than current methods of visually sampling and counting each organism. Biodiversity is essential for the survival of unique ecosystems like kelp forests and coral reefs. The diversity of life is what keeps food webs in balance. And… if coral reefs inspire you…don’t miss this special opportunity to see the highly acclaimed documentary, Chasing Coral. The Houston Museum of Natural Science (HMNS) has a one-night-only screening of the film at their Wortham Giant Screen Theatre on Wednesday, June 6th at 6pm. Emma Hickerson, Research Coordinator for NOAA’s Flower Garden Banks and Marine Sanctuary, will be there to provide commentary about the film and to answer questions. Ask her about opportunities to use bioacoustics to restore damaged reefs. How could bioacoustics help our own Texas Gulf Flower Gardens? Ticket link. As most of you are aware from a previous post, Mr.Caldwell and I are traveling to our chosen spot in the high desert of Madras, Oregon to experience “totality” during the Great American Eclipse. We are excitedly anticipating the opportunity to experience all the sights, sounds and feels as our sun is fully blocked by the moon for about 2 minutes. Link to… Totality Awesome! But, on Monday, August 21, 2017, if you are properly prepared, you can “get eclipsed” too! That is because our sun will be at least partially eclipsed by the moon from the viewpoint of every state in the U.S. This rare opportunity has not occurred since 1918!! The percentage that the sun will be partially covered varies depending on your proximity to the pathway of eclipse totality. For example, if you live in San Francisco 76% of the sun will be covered by the moon’s shadow, 87% in Chicago and 67% here at home in the Houston metropolitan area. In Houston, the eclipse starts at 11:45am CT with maximum coverage (67%) at 1:16pm and the eclipse ending at 2:45pm. When you check out the Time and Date weblink, run the animation to see how the partial eclipse will actually appear for its duration….weather permitting of course! Here is a link to a Houston KPRC Channel 2 eclipse news report…Click2 Houston ~ August 21 Eclipse Many spots in Houston are offering eclipse viewing “parties”. Even our local Woodlands library on Lake Robbins has an event scheduled that day! SAFETY FIRST! Looking at the sun anytime is dangerous because its harmful UV rays can permanently damage our eyes. Instinctively (it hurts! ), we don’t stare directly at the sun when we are out enjoying a beautiful sunny day. However, during a partial eclipse, we will want to stare at the sun to observe the movement of the moon across it. This is NOT SAFE unless you are wearing protective ISO 12312-2 rated eclipse glasses. Prepare!! You should purchase these NOW as they are selling out quickly from online retailers. Purchase only from NASA approved suppliers: American Paper Optics, Baader Planetarium (AstroSolar Silver/Gold film only), Rainbow Symphony, Thousand Oaks Optical, and TSE 17 to insure you have the quality necessary to fully protect your eyes. Follow the directions on the glasses for the safe amount of time you can view the sun directly. Amazon was carrying the American Paper Optics brand that I’m trying out. As of today they still have supplies. As soon as you get your glasses, go outside and look at the sun with them. It is pretty cool to just see what the sun normally looks like and then you will have that knowledge for comparison to the eclipse. If clouds are passing by they will cast a shadow on the sun too. Since most of you will be at school during peak eclipse viewing time you should plan ahead by alerting the teacher for the class you will be in during the eclipse. It could be great fun to help your teacher with a lesson that includes taking the class outside for a mini field trip! Of course, if you are lucky enough to be in a science class at the time of the eclipse, getting your class outside to experience the wonder of such a rare natural phenomenon will likely only require a simple suggestion to your instructor. But, for other subject areas you made need to offer up some ideas for making your “field trip” an educational experience. Perhaps a language arts teacher could have you reflect in your writing journal on how seeing your sun’s light partially blocked makes you feel? You could write a poem? An art teacher could have you create a visual representation of your experience using water colors? Perhaps with a social studies or history class you could research the impact of total eclipses on ancient civilizations? Did you know that in 585 B.C. a war in what is today central Turkey came to an abrupt end when a total solar eclipse was seen as a sign for peace? I’m sure there are more interesting stories that could be researched by inquiring minds! Maybe you can have a few pairs of eclipse glasses that your class can share or get even more energized and make a few cool pinhole viewers for indirect observations of the sun by you and your classmates. They are cheap and easy to make. You don’t have to be in the moon’s narrow umbra shadow to be a part of the Great American Eclipse on August 21st, but you do need to plan and be prepared if you hope to “Get Mooned”. Stay curious and Never Stop Questioning!! How many times have you heard me say the words in the title of this blog post? I just thought I’d share that I use a science log book too! I’m using my log book these days for scientific drawings of the corn snake babies. 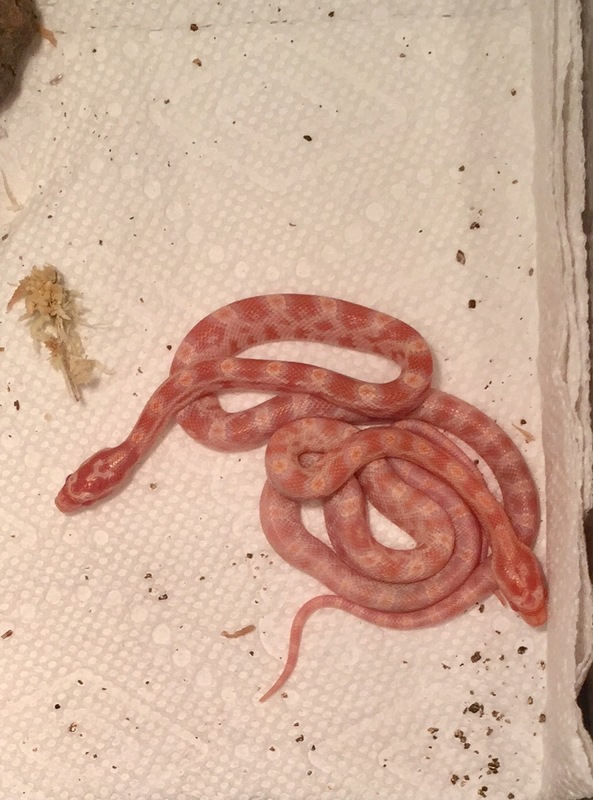 I need to make sure I can tell which baby corn snake is which. It is important that I know who’s who so that I can keep track of each baby’s health. Who shed? Who ate? Who made waste? Who didn’t? I keep the log book by their habitat. 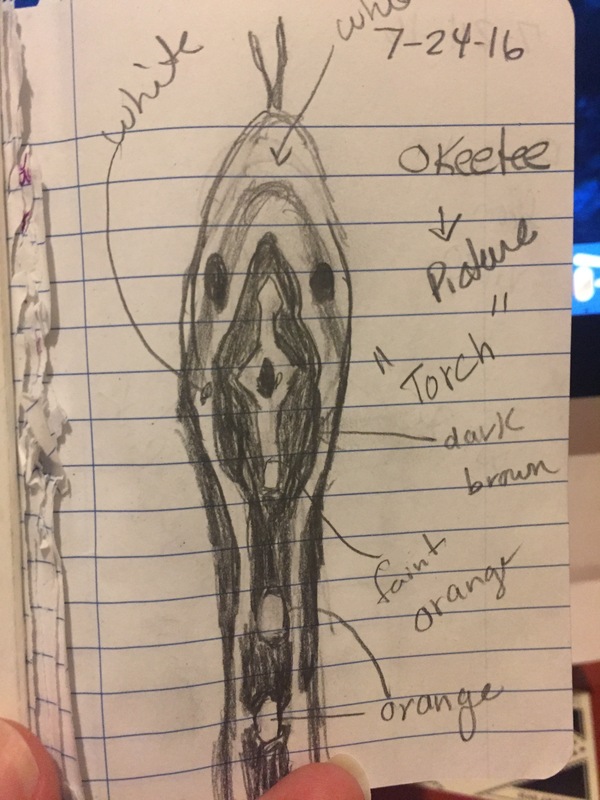 This drawing is of a little Okeetee that I’m calling “Torch”. Feel free to help me out! Send me your scientific drawings of the baby corn snakes as you observe my pictures and videos. Do you have any names you’d like to suggest? It’s been a few days since the first of Cookie and Brownie’s offspring started to peek out into the world. Sadly two eggs are still in the incubator with no signs of hatching. It’s not too late for hopeful thoughts but the odds of them hatching now are slimming. 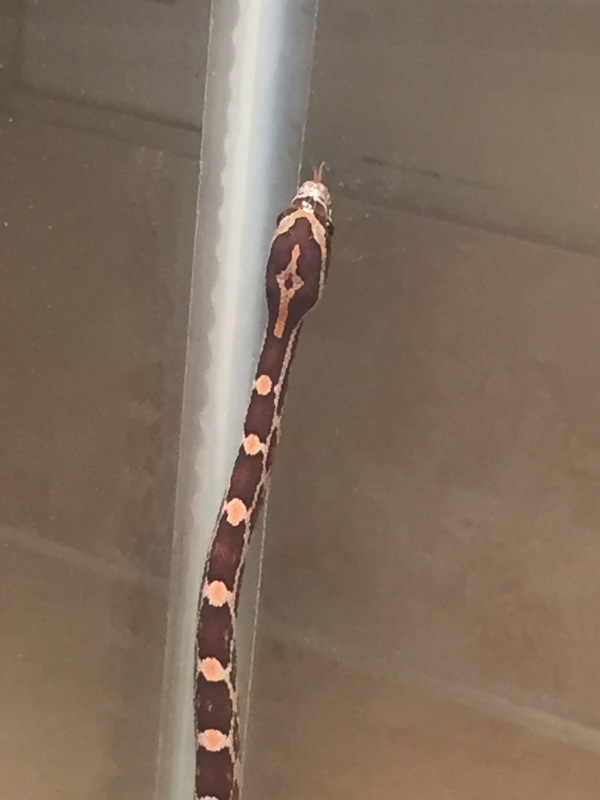 I know several of you are interested in adopting one of these cuties so today I thought I’d share how to set up a baby corn snake home. The owner and staff are extremely knowledgeable and helpful especially if you are a first time herp owner. (Herpetology is the study of amphibians and reptiles.). If you never have visited this place …. GO!! It’s better than the zoo. I have all the baby corns right ﻿now in the small terrarium you see far left. I line the floor with paper towels as they are easy to change out every few days while I have so many little ones. You should start with paper towels too. Later I will change to the small pebbles/sand you see in the bigger habitats. 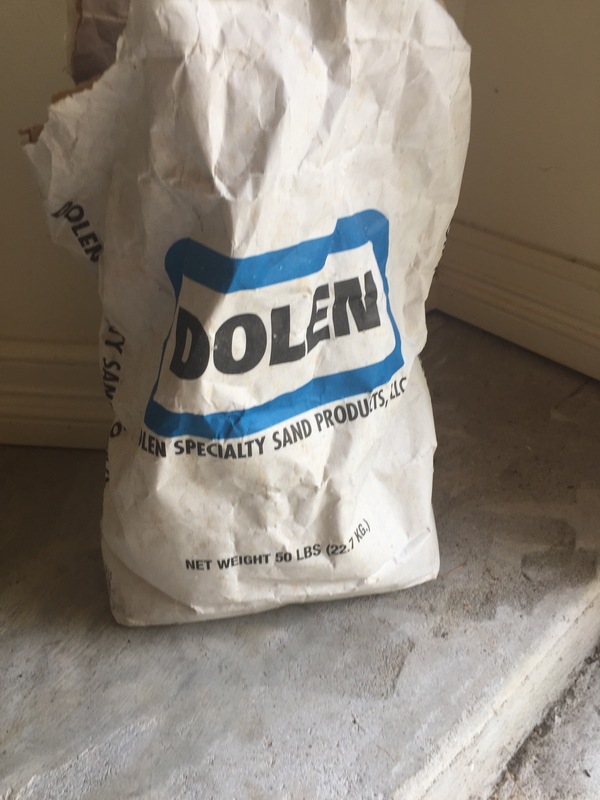 Above is the 50 lb bag of pebbles/sand that I buy from Pets a Plenty. (Fish R Us on 242 sells it too for $17.99) Don’t let anyone talk you into using cedar shavings as a floor material. Too difficult to clean!! I like to add all sorts of cool places for the baby corn snakes to hid. Cardboard paper towel rolls or empty yogurt cups work well. You will need a nice light to keep your corn snake warm. 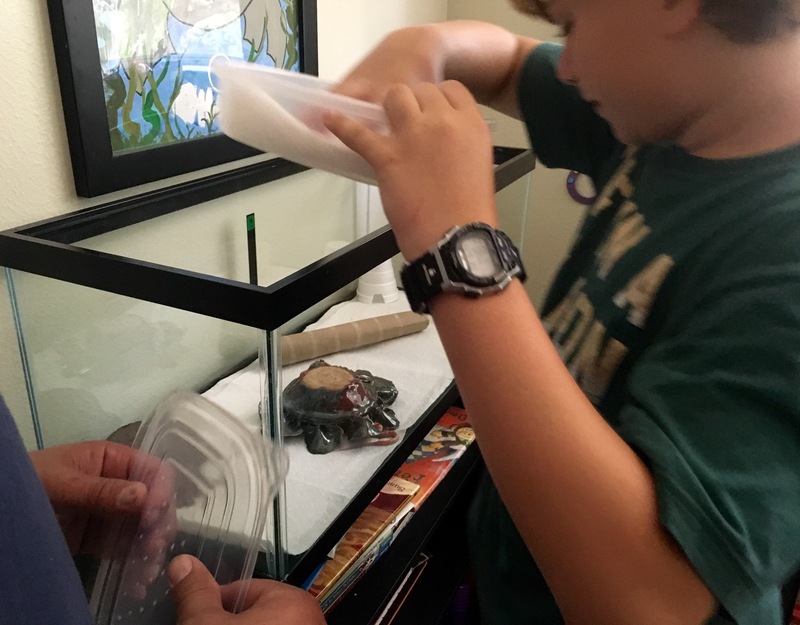 As soon as I placed the new snakes in their new home several sped over to get a drink of water. Hatching must make you thirsty 🙂 You will need a heavy water dish that can’t be knocked over. Important…. I wet a bunch of sphagum moss and put it in under the snakes’ hide structure. The moisture makes it easier for them to shed their skin. Corn snakes usually have their first shed about one week after hatching and will shed every few weeks as they grow. A few days after the first shed I can offer the baby corns their first meal. After the babies have eaten two meals with me then I know that they are healthy and ready for a new home! Sherbet has a new home! Our red albino, Sherbet, has left the Caldwell snake nursery and is all settled in at the Beagle home. Check out the great habitat Nick set up. If you zoom in on the photo you’ll make out Sherbet close to Nick going into his/her hide. Nick will keep us updated on how she settles in. Who will be the next baby snake to find a new home?